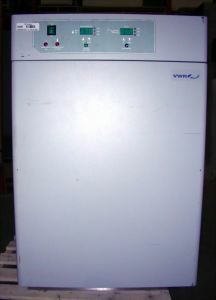 Product Description This VWR 2300 CO2 incubator is equipped with thermal conductivity control. It has a 19 gallon water jacket and a microprocessor control. The chamber has a capacity of 6.5 cu-ft. and the temperature range is 5C above ambient to 60C ±0.1C. The CO2 range is 0-20%. These incubators provide superior temperature stability and protect cultures by surrounding them with a non-corrosive stainless steel chamber, insulated triple-wall cabinet construction, and a jacket of temperature-conditioned water. Cultures are protected from unwanted heat loss even in the event of a power outage, ideal for laboratories where disruption of power or significant ambient temperature fluctuations are a concern. Easy-to-use interface panel features separate large LED displays for temperature and CO2 parameters and convenient touch-sensitive membrane controls that provide the status of incubator functions. Internal shelves and supports are easily installed and removed. Remote alarm contacts allow connection to an in-house alarm system.